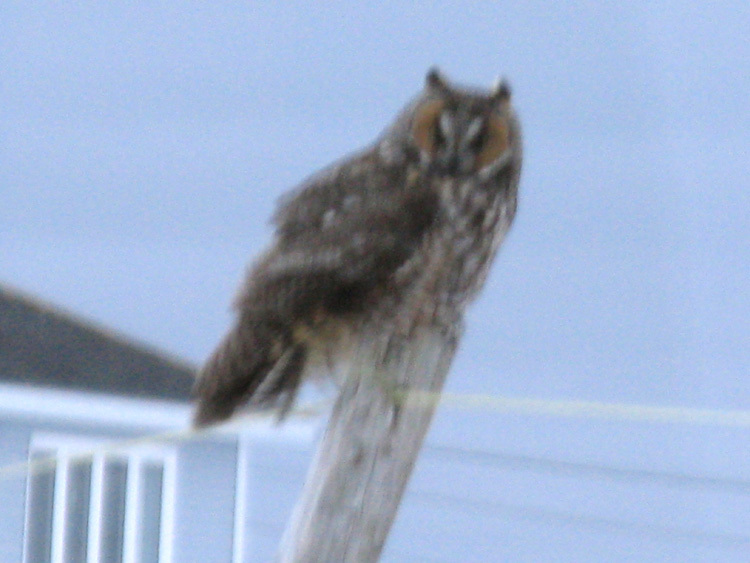 This Long-eared Owl was photographed at dusk through a window in Portugal Cove South on February 23, 2013. It marked the fifth confirmed record for Newfoundland. Origins: Resident in temperate regions across North America, Europe and Asia (but not in Newfoundland & Labrador). Record Details: Six or seven records for Newfoundland: (1) An individual with an injured wing was found near Harbour Grace in late November 1989. Other injured birds were picked up at (2) Shallow Bay campground, Gros Morne National Park on August 26, 1998 and (3) near Stephenville on February 8, 2007. Both were sent to Salmonier Nature Park for rehabilitation. (4) One was spotted near dusk at Ferryland on February 12, 2011. (5) An individual was photographed on a clothesline pole in Portugal Cove South on February 23, 2013. (6) Most recently, one showed up in Massey Drive, near Corner Brook, in mid-November 2014. Unfortunately, it did not survive the night and was found dead the next morning. There is also an undated historical record of one “killed” at Cow Head. On Aug 26, 1998 a Long-eared Owl was picked up at shallow bay campground, Gros Morne National Park. It had a broken wing and was sent off to Corner Brook and then on to Salmonier. Other then the broken wing it was in good condition. Thanks! I updated the information to reflect that.